Do you want to play Football but fear you cannot ‘keep up’? This fear is common amongst everyone as we grow older but this should not limit your participation opportunities, Walking Football is the perfect option for you. The team meet every Wednesday at 2pm, spreading across two 3G pictures. They enjoy one hour of playing Walking Football and one hour of socialising inside the Leisure Centre, tea and coffee provided. Currently, there are 48 members on the books and is constantly growing due to the popularity of the event. Nottingham Bramcote Walking Football Team are always looking to recruit new members. Everyone is welcome regardless of their ability! Aspirations have been set to expand the team to encourage more women to join in. Already there is one woman member. Being a part of the competitive team is just an option, many members of the team just play for fun! 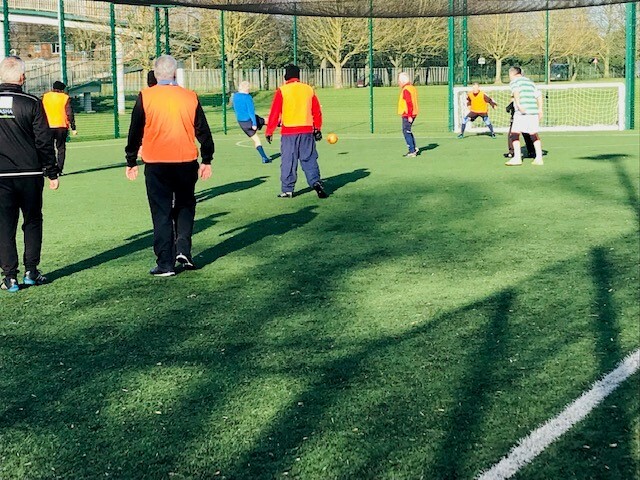 Walking Football can contribute to improving not only your health and fitness, but have a positive impact on your social life and achieving personal goals. Due to it’s adaptability it can enable people to play even with serious and debilitating conditions such as multiple sclerosis. Though the social aspect to the team is just as important as the football! For further information about Nottingham Bramcote Walking Football Team, contact Graham Moorcoft on 07986 610746.